South Sudan may not be the best vacation destination because there are reports of violence, carjacking, kidnappings, shootings, and other such crimes that may put your life in jeopardy. If you need to reach South Sudan in the near future, you should do so accompanied by a professional. Traveling alone is regarded as an almost sure suicidal mission. However, if you do not have to be in South Sudan, we recommend that you look for a safer vacation destination. A safari to Boma National Park or Nimule National Park, while beautiful to experience, is not worth the risk. Before you travel to South Sudan, you need to see what type of travel document you need. That is because all travelers who wish to enter the country need one. According to the visa policy of South Sudan, only the citizens of 7 countries, all in Africa, are eligible for a visa on arrival. All the other nationalities need to visit the nearest diplomatic mission of Sudan and apply for a consular visa. 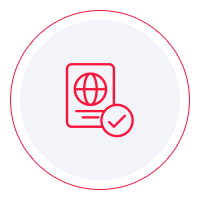 To learn which nationalities qualify for a visa on arrival and which do not, you have the option of taking a look at the visa policy of South Sudan. However, we recommend that you use iVisa’s Visa Checker. It is a tool that is easy to use, and the information you need is just three clicks away. Access the tool located in the top right corner of this page. You then select your country of origin from the left drag-down menu and South Sudan as the destination in the right menu. The result will be displayed in just a second and lets you know if you are eligible for a visa on arrival. If you do need a consular visa, you will be provided with a list of the nearest embassies you can go to and apply. Unfortunately, iVisa cannot provide assistance with the visa application process. What we can do, though, is give the information you need. That is why our support service is available 24/7, and it is free of charge. The next thing you must do is check out the South Sudan visa requirements. You can do that online because the internet is full of information. However, we recommend to use it as a reference only because not everything you find online is reliable. The best thing you could do is call the issuing authority and make your inquiries there. They can give you the most reliable information. In the meantime, we can tell you that all foreigners who travel to South Sudan need to have a valid passport that remains valid for at least another 6 months from the date of arrival. We are sorry that we cannot provide more assistance with the South Sudan visa application process, and we hope that the information above is useful.